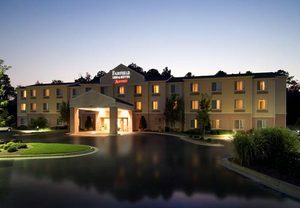 COLUMBUS, GA--(Marketwired - Apr 16, 2015) - Travelers headed to Columbus have long opted to stay at the Fairfield Inn & Suites Columbus thanks to its high level of service, value-added amenities and convenient location. But as the latest round of renovations to its public spaces nears completion, there are more reasons than ever to book a stay at this property where everything feels as good as it looks. Guests arriving at the hotel will discover updated spaces around every turn, starting in the guest rooms. Offering some of the most spacious and well-appointed suites in Columbus, Georgia, the hotel completed the renovation of its guest rooms in February 2015. Now these contemporary spaces accommodate travelers with all the same amenities guests have come to appreciate -- like thick mattresses, flat-screen HDTVs, free Wi-Fi and ergonomic workspaces -- alongside a refreshing new aesthetic that speaks to modern sensibilities. An exciting palette of colors invigorates travelers with gold accent walls appearing behind the beds, and a dark brown accent wall adding a rich element to each bathroom. Plus guest rooms feature new tile in the bathrooms and new carpet in the living spaces. In the coming months, visitors will encounter still more updates, this time in the public spaces. Renovations to the breakfast area (where guests enjoy complimentary hot breakfasts daily), lobby, indoor pool, outdoor patio and laundry room will wrap up in May. And soon, the remodeled business center, fitness center and Corner Market will all debut fresh looks as well. Located near Columbus State University, the Fort Benning army base and Aflac, the hotel is familiar with the needs of business travelers. And because its highly experienced staff remains as committed as ever to a positive guest experience, the hotel has worked to maintain a high level of service even in the thick of remodeling. The business center, for example, has remained open during its overhaul, and efforts have been made to reduce noise so that visitors can enjoy both productivity and peace according to their schedules. As the property prepares to complete all of its renovations, travelers can anticipate an elevated experience. In addition to being one of the few hotels in Columbus, Georgia with an indoor pool, free Internet access throughout the property, spacious accommodations and complimentary daily breakfasts, it will serve as a benchmark for inspired design. And that can't help but inspire visitors during their stay. At the Fairfield Inn & Suites Columbus, comfort and service infuse every guest's stay. The hotel boasts a range of complimentary services, including high-speed Internet access in both guest rooms and public spaces, on-site parking, daily hot breakfasts and a full-service business center with 24-hour Internet and printer access. Guest rooms are ideal for extended and short-term stays, featuring crisp cotton linens, small appliances like microwaves and refrigerators and 42-inch, flat-screen HDTVs with premium cable. Visitors can stay active in the fitness center and at the indoor pool, while the hotel's close proximity to historic downtown Columbus, the RiverWalk, the Peachtree Mall and numerous businesses make it easy to get out and explore. Top service and stylish amenities await guests of Fairfield Inn & Suites Columbus with the hotel’s soon to be completed renovations.